A great horned owl waiting for the sun to go down so their day can begin. Grand Teton National Park. Thanks Wendy, it could have been a bit of a wink. This guy was in plain sight of a huge number of people but we were the only ones to notice. Hope you have a great weekend. Owls are such aloof creatures! What a great shot with the sun shining so brightly on this old tree before it sets. Nice. Thanks, I did like early evening sunlight peeking into where this guy was at that day and the tree and owl just go together so well. Have a great weekend. Thanks and thanks for the feedback we really appreciate it. Hope you have a great weekend. Magnificent bird – it always amazes me how perfectly their feathers provide camouflage. Hi Eliza, that is indeed true. The differences between the feather colors of great horned owls depending on their nesting location and environment is really amazing. They always seem to match perfectly. Hope your weekend is going great. Another great shot. Another species not seen in the UK. Thanks, these are for us the most abundant owl in our region of the US. The composition of this photo knocks me out. Isn’t it amazing how much there is to see, if only we LOOK. Thanks Melissa, it is always tough to photograph both the animal and the environment and I am glad you can see both in the photo. Have a great day. HI Miriam, I agree and it seems that each great horned owl I come across is perfectly matched for the slightly different environment they live it It is quite amazing how feather color can adapt so locally. I thought when I saw this that the owl was unusually light colored, but as you mentioned in comments, there is great variation in color. It made me wonder about the surroundings. I’m used to the eastern variety of this owl and they are darker, because our trees are darker. In any event it’s a gorgeous specimen. Isn’t it interesting how many people don’t look up? HI. 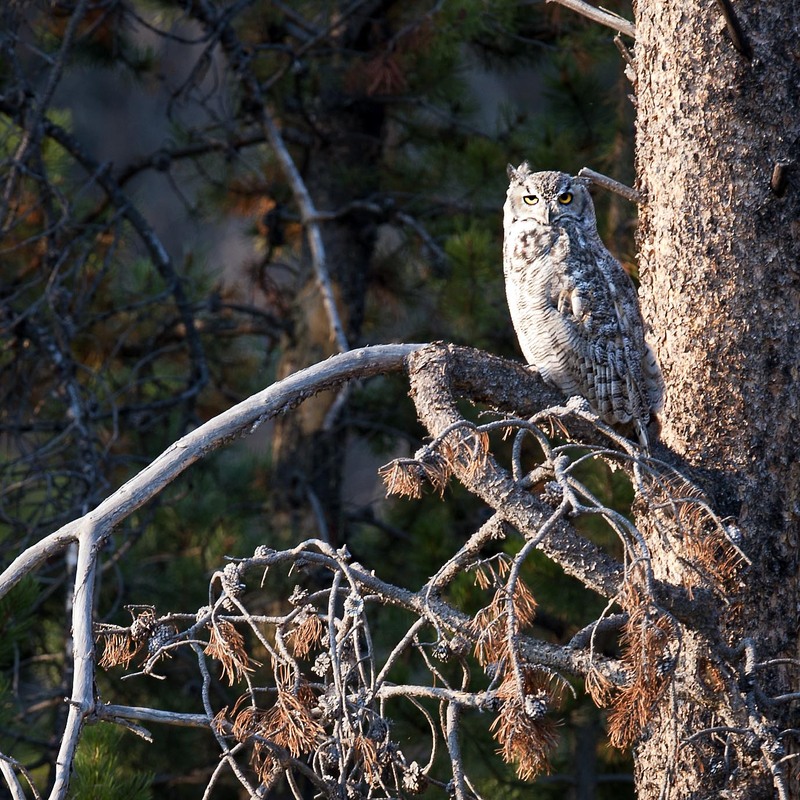 We have noticed that the owls around here do indeed blend into their sounding colors very well. One particular group lives in some sandstone cliffs and they are the reddest great horned owls I have ever seen. It is indeed one good looking owl. Hope your day is going well.